As hundreds of people in Paris, and all around the world, stood helpless watching the Notre-Dame Cathedral burn, world leaders, celebrities and public figures took to social media to share the sentiment of sadness over the tragedy. Notre Dame, one of Paris and France’s most famous landmarks and historical buildings was set ablaze on Monday. Although an investigation to determine the origin of the fire is still on the way, members of the Paris fire department believe the incident is "potentially connected" to a renovation project currently underway. "Nothing shows that it's an intentional act," said Paris Prosecutor Rémy Heitz in a press conference on Tuesday. The fire devastated large parts of the 850-year-old Gothic church. 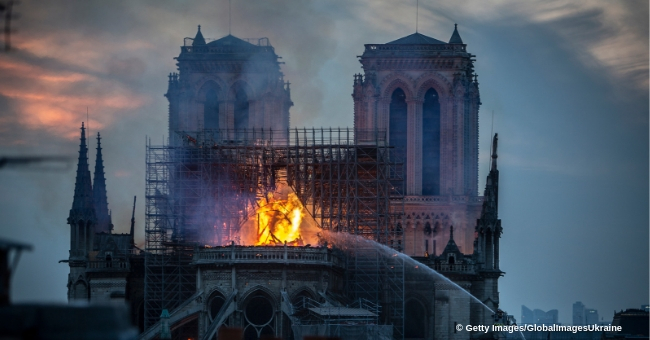 The iconic spire and roof of the building were destroyed, but the twin medieval bell towers were spared after firefighters spend 12 hours fighting the flames. As people in Paris took to social media to share videos of the building engulfed in flames, world leaders, celebrities and other public figures took to their accounts to share their words of disbelief over the incident, with most mentioning the cultural and historical importance of the cathedral. The French Interior Ministry's Civil Security and Crisis Management agency rebuffed Trump’s proposal, pointing out that dropping water from an aircraft was counterproductive, as it could damage the cathedral’s structure. Former President Barack Obama also addressed the situation, sharing an Instagram pic taken years back inside Notre Dame, alongside his wife, Michelle Obama, and their daughters Malia and Sasha. “Notre Dame is one of the world’s great treasures, and we’re thinking of the people of France in your time of grief. It’s in our nature to mourn when we see history lost – but it’s also in our nature to rebuild for tomorrow, as strong as we can.,” Obama captioned the post. "I know this is an inspired representation of an even greater divinity. I know this blessed place is a human-made interpretation of what is mysterious, unknowable, and undefinable and while seeing her burn brings tears to my eyes, I know even flames cannot diminish her sacredness. Still, not her. Please. Not her. #notredame #ourlady." “Havana” singer, Camila Cabello, tweeted: "My heart is breaking seeing the fire at Notre Dame. I’ll never forget walking in the first time in Paris and being in awe of the beauty of it." “This is just devastating. Mes sympathies à Paris" added “Grey's Anatomy” creator Shonda Rhimes. While people all over the world keep mulling on the significant loss of part of Notre Dame, the French President, Emmanuel Macron, vowed to rebuild the cathedral and asked anyone willing to help to come forward. Immediately, some of France wealthiest families pledged a combined €500 million to help re-build the building. According to experts, the process will be expensive and lengthy, but immediate steps will need to be taken to prevent further damage to the now vulnerable structure.